Sandy Hooper and Martin Rogers of USA Today Sports won first place in the Associated Press Sports Editors’ 2018 contest in video for the A Division. 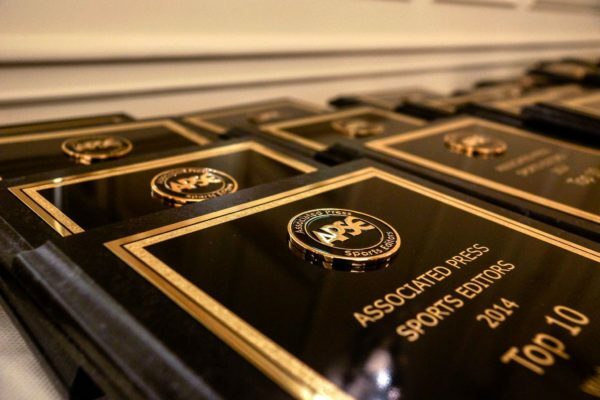 Hooper and Rogers will be presented a first-place plaque at the 2019 APSE Summer Conference Banquet at the Omni CNN Center in Atlanta on June 19. Hooper and Rogers edged Sean Connell, Mark Bader, Tony Stolfa and Kyle Bogar from FloSports. A Bleacher Report staff produced video placed third. Sports editors in the A Division submitted 46 video entries. The contest is open to APSE members. Click here to join. Contest chair Todd M. Adams and fellow APSE officers John Bednarowski, Lisa Wilson and Dan Spears prepared entries. In February, preliminary judges at the APSE Winter Conference in Orlando, Fla., and off-site around the country, selected a top 10, with each judge ranking the entries in order from 1 to 10 separately on a secret ballot. Entries were given 10 points for a first-place vote, nine points for second and so on down to one point for a 10th-place vote. The final 10 were given to a second judging group, which ranked the entries 1-10 in the same fashion. The winner in each category will receive a plaque at the summer conference. The second- through 10th-place writers will receive frameable certificates.